I recently went to Sydney for a holiday with my sister Juji and her fiance Jay. I’m proud to call Perth home but the eating in Sydney is magnificent! This is the first of my posts about the trip. We’ve eaten on the plane but by the time we arrive in Sydney just after 1pm we are starving again. After checking in, a quick refresh and swapping sneakers for flip-flops, we’re ready to start our Sydney eating adventure in Chinatown. There are many enticing food options on Goulburn Street, but with its pictures of plump birds roasting en masse and the many meats hanging proudly on display, it’s hard for a carnivore to resist the lure of BBQ King. I love the picture on the front of BBQ King’s menus. 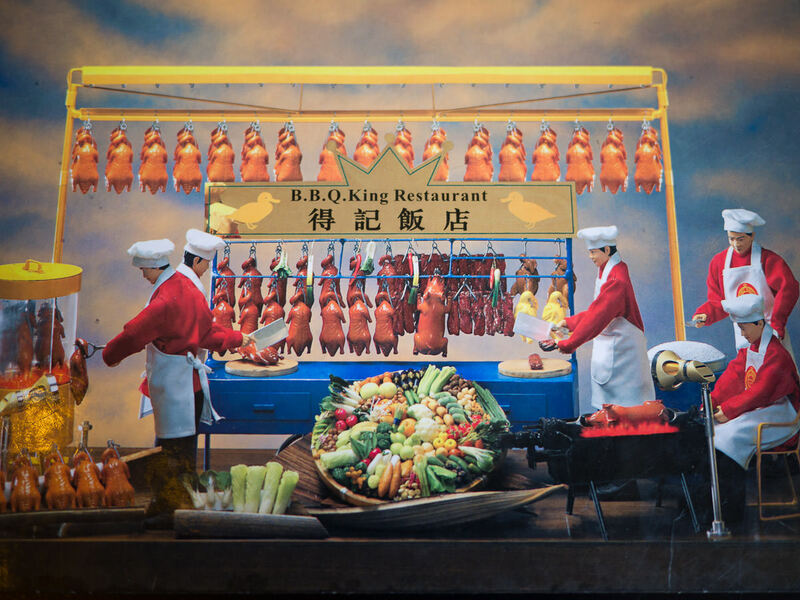 Yes, the long armed chefs look like creepy mannequins, but the Chinese roast and barbecue meats look glorious! I could stare at it for a long time, picking out all the details, identifying all the meats and vegetables. 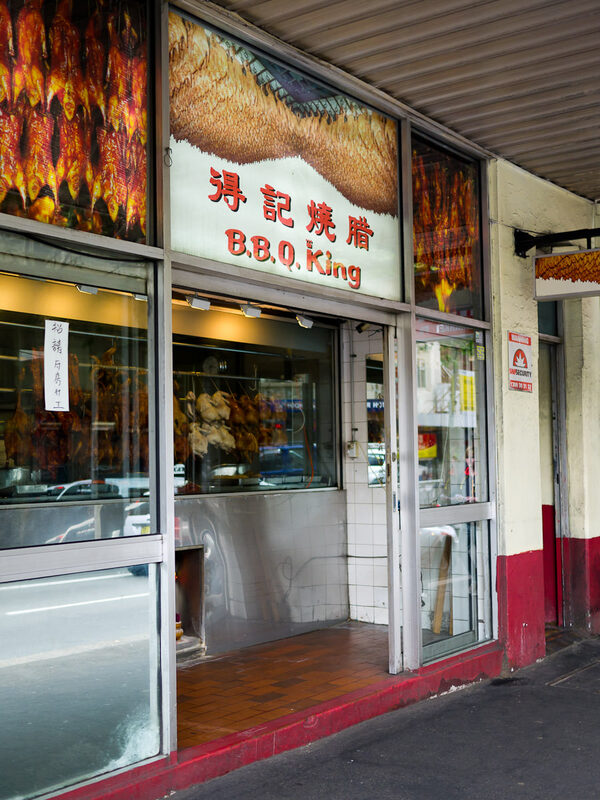 Like most Chinese BBQ restaurants, service at BBQ King is brisk, with no time-wasting chit-chat. 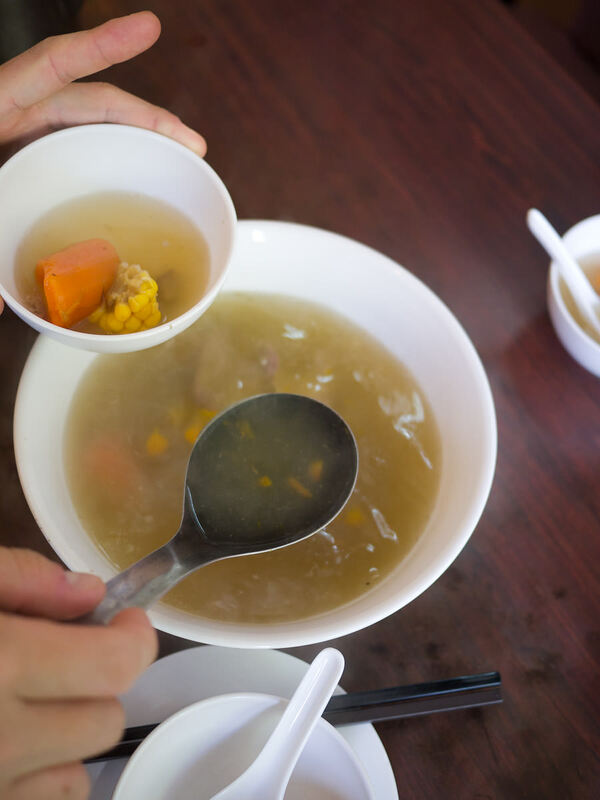 A waiter pours Chinese tea, slaps bowls and chopsticks down on the well worn tabletop and brings us a steaming pot of complimentary soup. 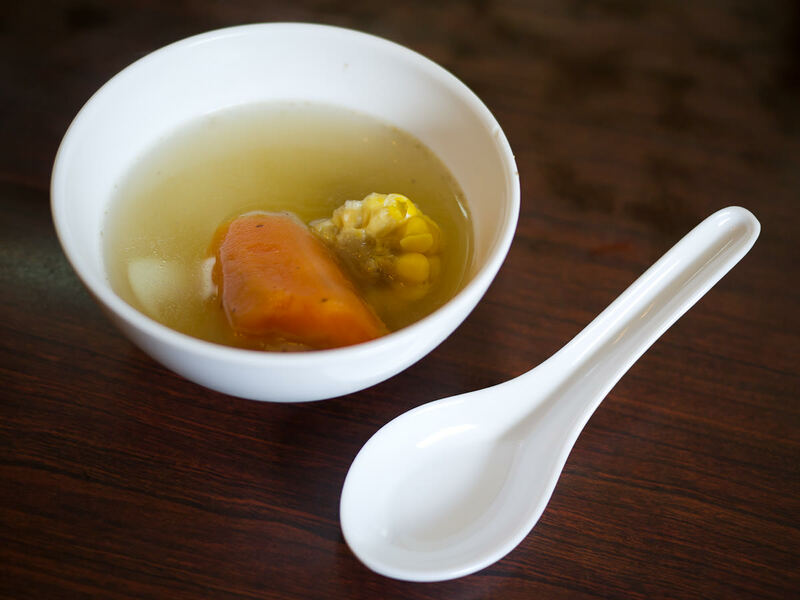 It’s a fragrant broth filled with treasures: pork bones, sweet carrots and chunks of corn on the cob. Jay dishes up soup for us all. 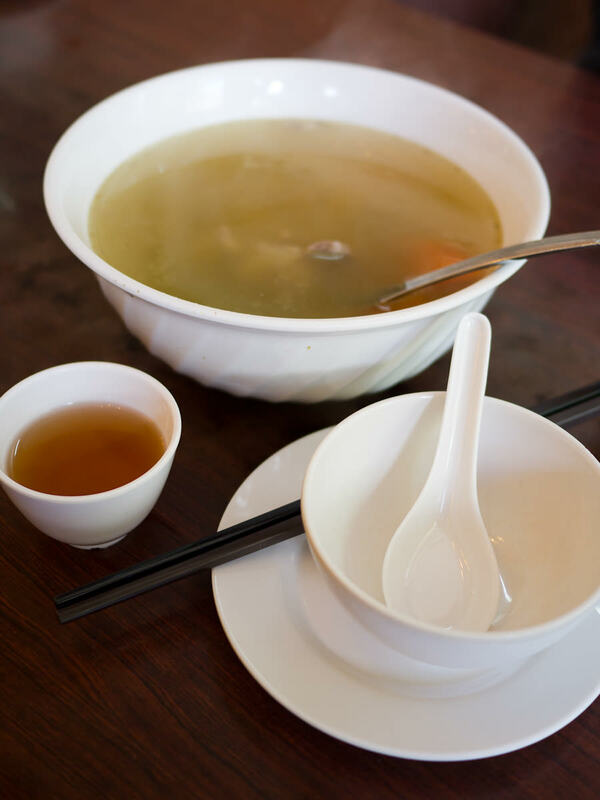 The meaty broth is the perfect restorative elixir after our flight. We’re eating lunch late and I’m acutely aware of the dinner booking we have for this evening – I fight the temptation to have a third bowl of soup. But I can’t help fishing around in the soup to find every last porky morsel. 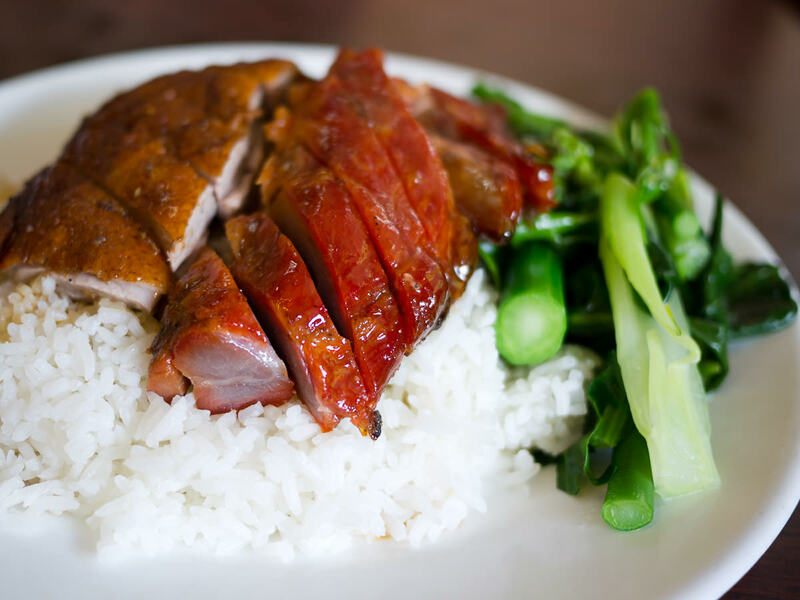 I’m glad we’ve decided to share a couple of dishes – the BBQ pork and roast duck with rice (AU$14) would be a huge serving for one. 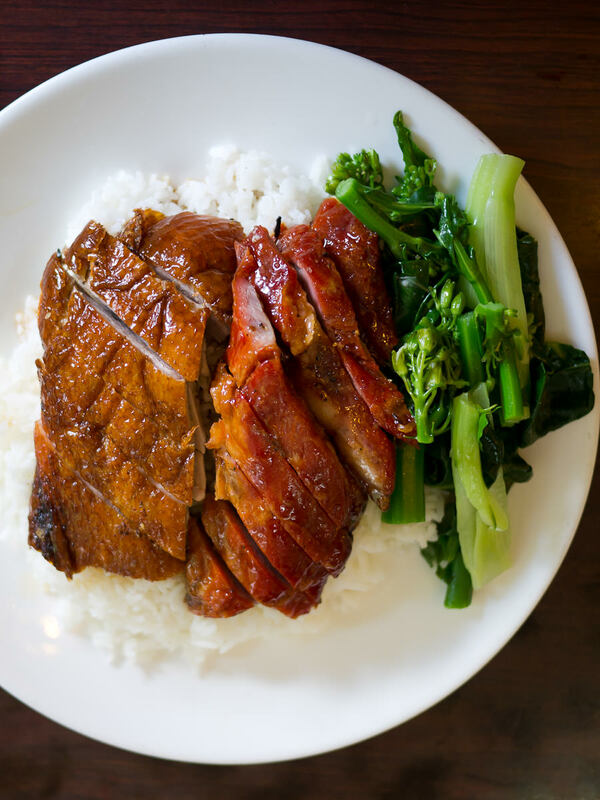 It’s served with blanched kai-lan (Chinese broccoli), beautifully bright green with juicy leaves and tender stalks. 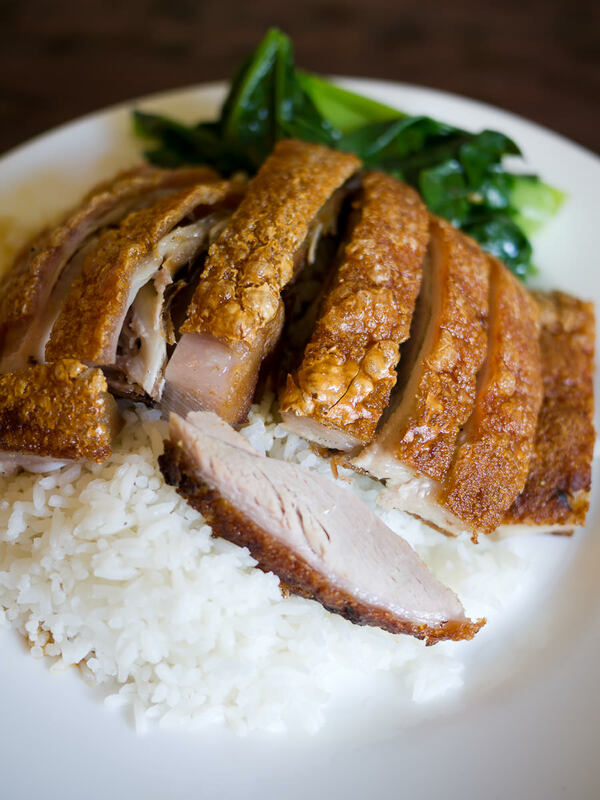 The BBQ pork is wonderfully shiny and tender, marbled with just the right amount of fat. The charry bits are everyone’s favourite and it’s hard to not be grabby. 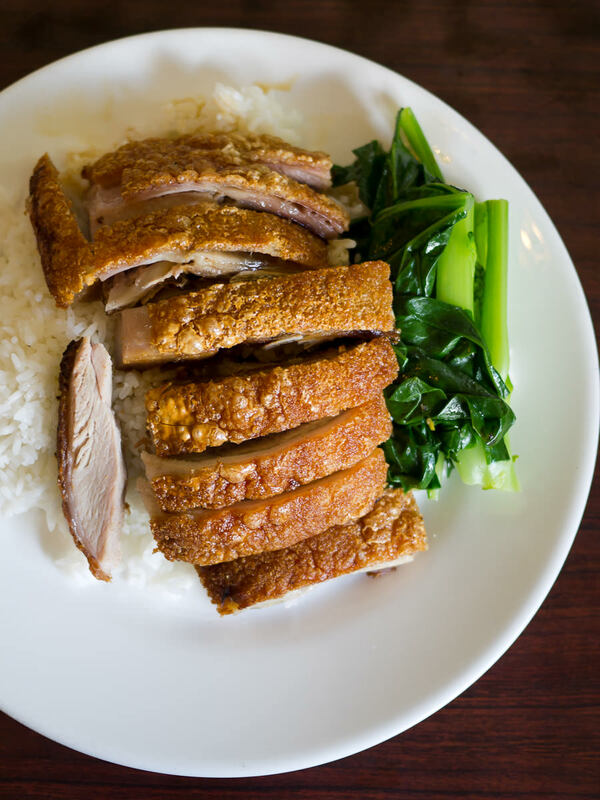 Juji reckons she’s eaten better roast duck back in Perth but I’m happy to get greasy-lipped from this duck. We also share suckling pig and rice (AU$18). 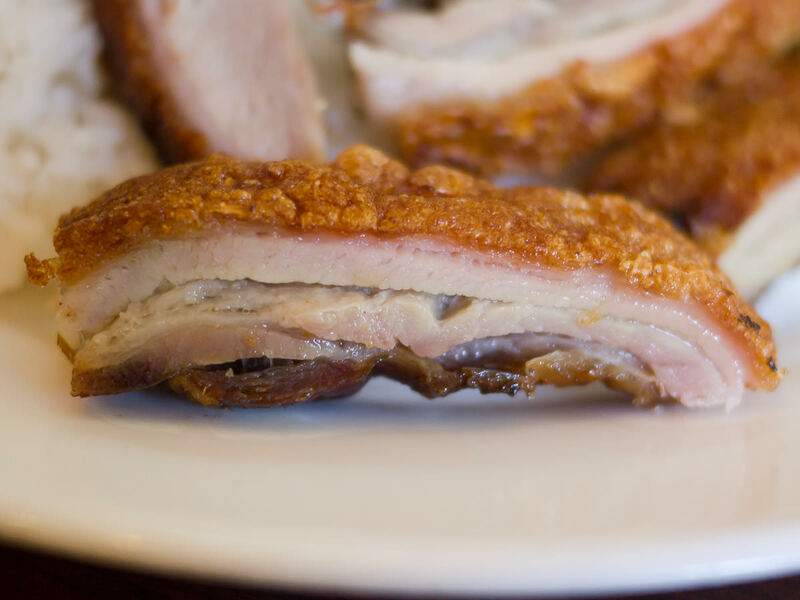 I think I hear angels singing when I see that crispy golden crackling. 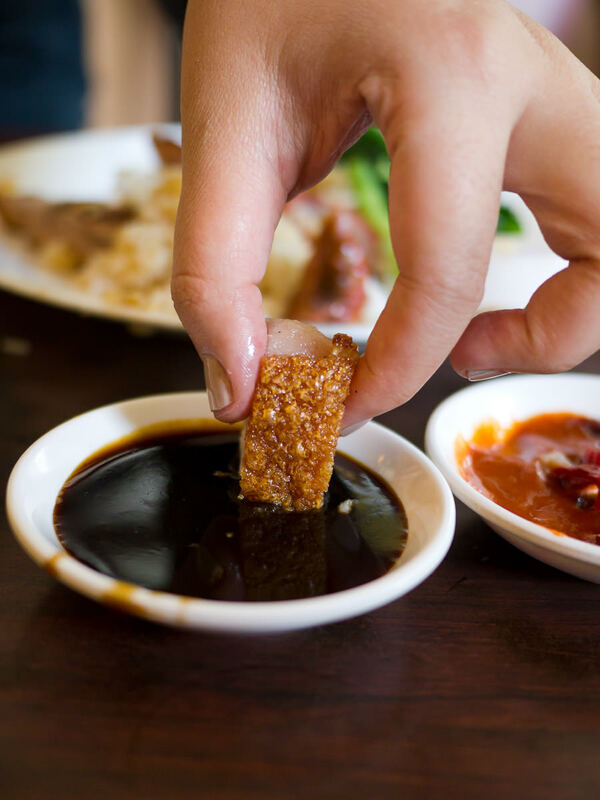 The suckling pig is superbly succulent, with the bubbly crunchy crackling and a soft melting layer of fat in each slice. I’m now going to ask a very serious question: How many textures of roast suckling pig do you see in the picture below? How many textures of roast suckling pig do you see? Next to the restaurant is BBQ King’s takeaway counter where a man wields a cleaver, constantly chopping meat on a thick wooden block. This menu is posted on the wall. Marinated pork uteri and duck tongues, anyone? 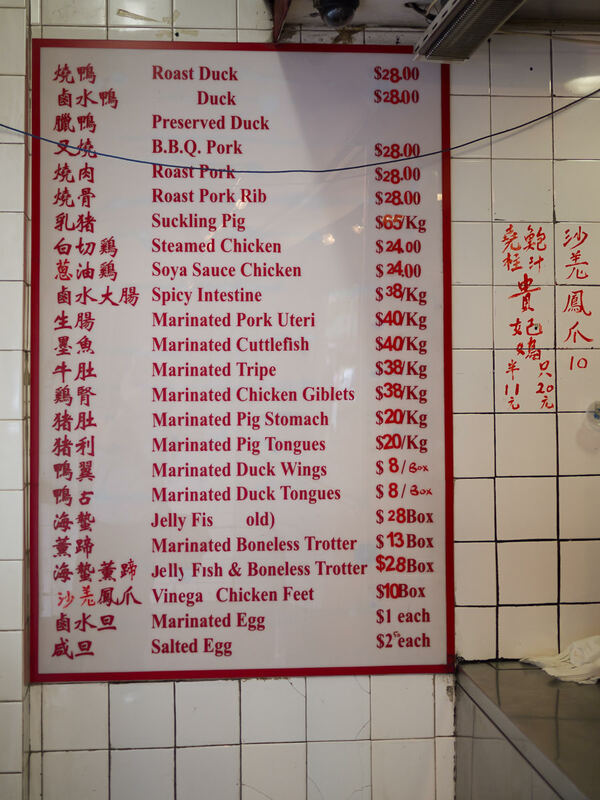 BBQ King meat menu – marinated pork uteri or duck tongues, anyone? Written in Chinese on the tiles next to the menu is: “Fried Chicken’s Feet $10” and “Gui Fei Chicken whole $20, half $11” (translation courtesy of my sister CW). A tasty lunch and a great start to our eating adventure in Sydney! 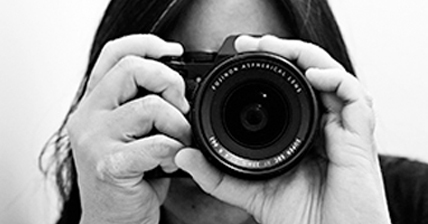 See Juji’s blog post about BBQ King. Back in Perth we’ve had complimentary soup at Golden King BBQ, Northbridge. If you know of anywhere else in Perth the free soup is served on arrival, feel free to let me know in the comments.